Eight idyllic spots for a summer picnic in the mountains of Jackson County, N.C.
You can’t throw a pickle spear without hitting a picnic spot in Jackson County. Scenic beauty runs wild in these hills, setting the stage for the ultimate al fresco dining experience. Want a waterfall? No problem. A shady river bank? Got it. Summit views? Got those, too. 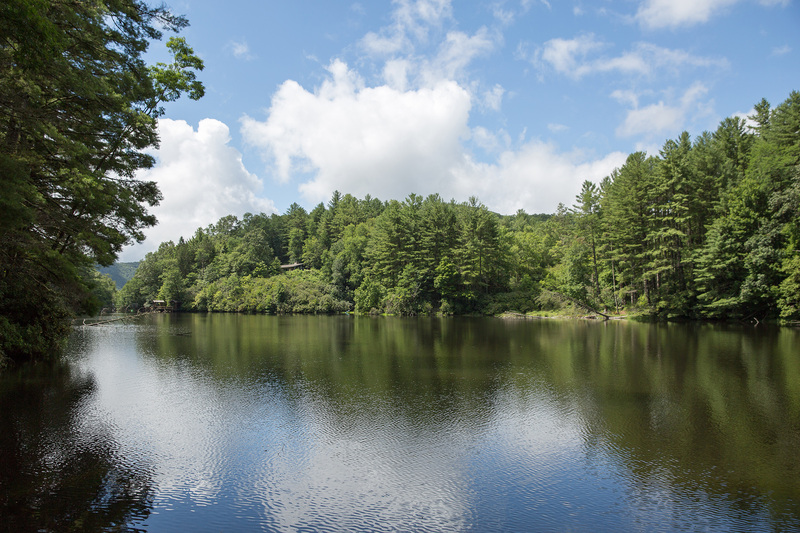 From sunny lake shores to cool forests and manicured parks to secluded groves, discover the perfect picnic spot in the N.C. mountains of Jackson County. Once you’ve picked a spot, build the ultimate picnic feast with local flavors grown and made in Jackson County. Go gourmet with wood-oven bread drizzled with mountain honey and slathered in goat cheese. Pick up creative sandwiches, pastas, chicken salad and hearty meals to go. Graze away the afternoon with sampler platters and appetizer spreads. Cap it all off with a giant slice of pie or handmade chocolates. So, grab a blanket, pack a basket and Play On with our curated insider’s guide to mountain picnics. Bon appetite! Lay of the land: Feast under the picnic shelter, or claim a patch of lawn in the sunshine or under a shade tree in this expansive park setting. Stroll the meandering paths, explore the gardens, view the outdoor sculpture exhibit, and turn the kids loose on the sprawling wooden playground. 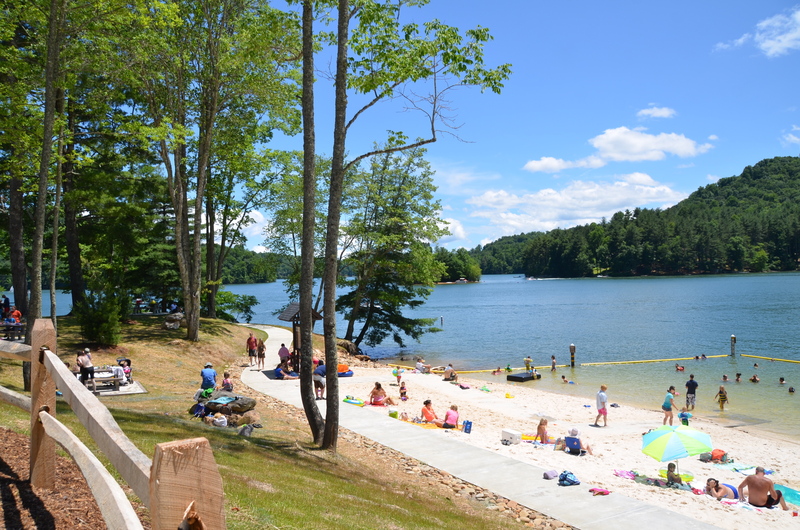 How to get there: Located at the crossroads of U.S. 64 and N.C. 107 in Cashiers, N.C.
Lay of the land: This sandy beach on scenic Lake Glenville has shady picnic tables or you can spread your own blanket along the shore. Pack a suit to take a dip in the cool, glistening waters of Lake Glenville with a roped-off swimming area and loaner life jackets. How to get there: From N.C. 107 in Glenville, N.C., turn onto Pine Creek Road. The recreation area is on your left after crossing the dam. For GPS, use the address of 1965 Pine Creek Rd, Cullowhee, NC. Lay of the land: A short hike leads to the base of your own private waterfall along the headwaters of the Tuckseegee River below Lake Glenville. The multi-tiered falls tumble and cascade down a 100-plus-foot cliff. The hike is only three-quarters of a mile, but has dozens of stone steps leading down to the falls — that must be climbed up again — along with foot bridges hewn from logs. How to get there: From N.C. 107 in Glenville, N.C., turn onto Pine Creek Road. The trailhead is on your right after going over the dam and across from the Pines Recreation area on the lake shore. Lay of the land: This small, high-elevation lake evokes solitude and wilderness within the Nantahala National Forest. There’s a picnic shelter, half-mile trail around the lake and a fishing pier. Located in a community known as Little Canada, the ecology of this mountain lake will feel like you’re in Maine. How to get there: From N.C. 107 in Tuckasegee (about halfway between Sylva and Cashiers) turn onto N.C. 281. Go nine miles and turn left on Charlie’s Creek Road. Go six more miles. Lay of the land: This public park on the shores of the Tuckasegee River has a covered picnic shelter, along with picnic tables and grills scattered along the river’s shore. The lazy river is great for wading, swimming, skipping rocks and tubing. There are loaner life jackets to borrow, plus volleyball and basketball courts. How to get there: Located along N.C. 107 south of Cullowhee. For GPS, use the address of 6912 Highway 107 Cullowhee, N.C.
Lay of the land: This large public park complex is within walking distance of downtown Sylva, a perfect spot for an easy-access picnic. Along with covered picnic shelters, there’s a dog park, a playground with a climbing wall, horseshoe pits, and walking paths. How to get there: Head west on Main Street from downtown Sylva and look for the park on the left. On foot, head toward the historic courthouse, and at the base of the steps, swing around to the right for just a quarter-mile walk. Lay of the land: This 1,000-acre preserve delivers forest glades and cascading streams just a short distance from downtown Sylva. While the 3.4-mile trail to the Pinnacle rewards hikers with panoramic views and rocky outcrops for a picnic above the clouds, it’s a steep climb. If you’re not up for the workout, simply stroll along the trail and scout for a picnic spot that suits your fancy, with ample stream-side settings and unusual rock formations to nestle among. How to get there: From Sylva, turn onto Skyland Drive at the stoplight by McDonald’s. Go 2.6 miles and turn left onto Fisher Creek Road. Go another 2.1 miles to reach the parking area. 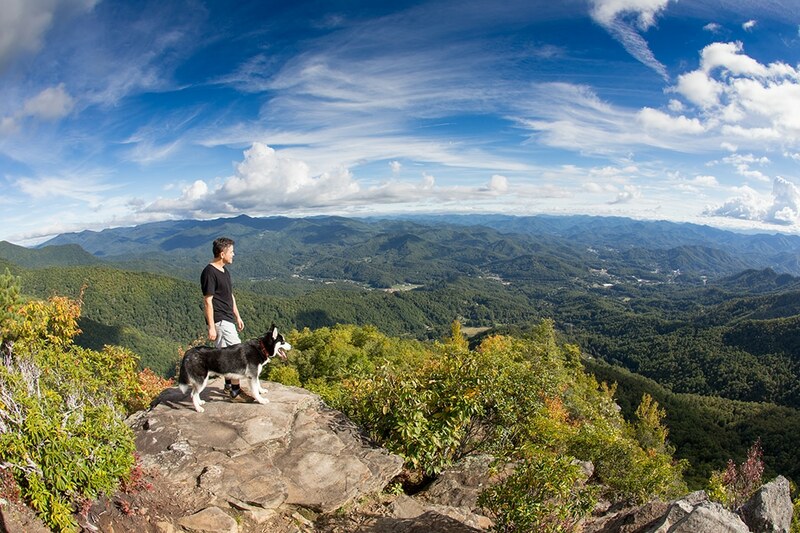 Lay of the land: For sweeping panoramic views, head to this high-elevation picnic spot along the Blue Ridge Parkway. There are stone picnic tables plus grassy clearings for spreading a blanket, all offering long-range views. The parking area is already at 5,719 feet, but if you want to get even higher, take the short, but steep, trail to the 6,292-foot summit. Stop into the Blue Ridge Parkway Visitor Center while you’re here for maps, books and trail information. How to get there: From Sylva, head north on U.S. 23-74 for 10 miles to the entrance of the Blue Ridge Parkway at Balsam Gap. At the top of the entrance road, turn right onto the Parkway and go for seven miles to a spur road on your right that lead to Waterrock Knob. It’s located at Parkway milepost 451. Have picnic, will travel. Once you pick a spot, dive into the menus of our culinary landscape in Jackson County to fill your basket. For pasta dishes that hold up well, try Lulu’s on Main’s signature Italian Pasta Salad (with artichokes, sundried tomatoes, black olives, and toasted almonds) or their Thai noodle dish. Get a platter of creative gourmet sandwiches from City Lights Café (they do a PB&J for kiddos with picky palettes), Mad Batter Food and Film (try the hummus sandwich as a wrap) or Soul Infusion Tea House (they have that chicken salad sandwich you’re looking for.) For spreads suited to nibbling, ask for the goat cheese plate at City Lights or the Mediterranean sampler platter from Mad Batter. Another top take out joint is Cosmic Carry-Out, an innovative food truck permanently rooted downtown. Top off your basket with craft-made confections from Baxley’s Chocolate, or pick up a selection of famous homemade pies from The Coffee Shop. The quaint village of Dillsboro is crawling with cafés and eateries. Try The Well House for deli sandwiches, wraps and chicken salad or load up on a BBQ feast from Haywood Smokehouse. From ribs and BBQ pork to signature southern sides, check out their “family-style” menu designed for family-sized to-go orders. A swing through Dillsboro Chocolate Factory for fudge and truffles is a must. Peach pie and chicken salad anyone? Fill your basket with a little of everything from the Cashiers Farmers Market. The specialty grocer carries local dips and jams, fresh baked goods, and mouth-watering take-out BBQ. Their peach pies in summer go like hot cakes. Plus, they do the picnic standards of chicken salad and egg salad. You’ll find a selection of traditional deli and gourmet sandwiches at the Randevu. For a twist on the picnic classic, try their curry chicken salad with sweet pineapple and toasted pecans. Order up a spread of apps from The Cork and Barrel Lounge in Sapphire, including meat and cheese platters, local smoked trout dip, and pretzel monkey bread. Take a stroll through the farmer’s market for fresh, local fare. Grab some fresh-baked bread, a jar of local honey and tub of goat cheese. Pick up a woodfired oven pizza from Backwoods Bakery or specialty popcorn from Smoky Mountain Kettle Korn. Along with seasonal produce, there’s no shortage of baked goods, from scratch-made granola, brownies, cookies and sundry sweets. The Jackson County Farmer’s Market is located at Bridge Park in downtown Sylva from 4 to 7 p.m. on Wednesdays and 9 a.m. to noon on Saturdays.